Businesses in the Highlands are struggling with increasing energy bills. We can help them save potentially thousands of pounds through simple energy-saving advice. There is always something that a business can do that will save money and save the planet as well. It's good for a business to have eco credentials these days too! We start with a short survey about energy and your business that can take as little as a few minutes. We can follow this with a chat with a trained energy advisor, which is an opportunity to discuss further ways of saving energy. You can also borrow one of energy monitors FOR FREE! They're great at finding out just how much electricity you are using. The campaign – funded through the Scottish Government's Climate Challenge Fund – will run until March 2012, by which time we hope to have saved hundreds of tonnes of greenhouse gases. 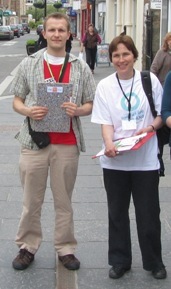 ‘Keep The Heat In’ started by advising businesses in Dingwall in June 2011. We moved on to Inverness in September and we will be running our campaign there until early 2012 before travelling east to Nairn. "Our campaign is about stopping energy waste, so we want to help businesses in the Highlands with all aspects of their energy use. One of the issues I most commonly discuss is low-energy lighting - almost every business I have spoken to could save energy by switching to energy-saving bulbs. Some have the potential to halve their bills by replacing their old, inefficient lighting." We are working closely with the Energy Saving Trust, the Carbon Trust and the Close the Door Campaign. It is surprising just how much help is available out there for businesses. We are also holding seminars to provide advice to local businesses on ways to save energy, the first of which was held at The Greenhouse in Dingwall in July 2011. We know that anyone involved in the business world is pressed for time, so we try to tailor our events accordingly. Get in touch with us if you would us to hold a seminar for employees in your business. Our most recent event was a drop-in on Monday 13th February in Inverness. There were presentations throughout the day, including from the Energy Saving Trust who provided advice on the incentives and support available to help businesses save energy. Focusing a campaign in a community makes it easier for us to work out what common barriers businesses are experiencing. We're finding that a lot of businesses are reliant on electric heating, which is expensive and polluting. We can help you work out how to use your electric heaters efficiently - halogen heaters may be a cheaper alternative because they warm the person rather than the air. A local campaign also encourages businesses to make the necessary changes together - hopefully our window stickers will help spread the message! Recent research has shown that shoppers are choosing stores that are conscious of their carbon emissions. So if you run a local shop and you're 'keeping the heat in', then put up one of our window stickers! If you are looking for other ideas to save energy, have a look at the Close The Door campaign website. We are working with the Energy Saving Trust, referring interested businesses on to them for a more detailed report on ways to save. Anything recommended in the free report qualifies for an interest-free small business loan. Broadly speaking, this can be paid back as the business saves money on their energy bills. Once it is paid back money continues to be saved. This could be anything from paying for loft insulation to solar panels. The scheme provides loans of £1,000 to £100,000 to SMEs, charities and private sector landlords. There are no set up charges and some technologies are eligible for Enhanced Capital Allowances. Up to date information is available on the Energy Saving Trust website, including case studies of what businesses have financed through zero-interest loans. Doing business in the Highlands often means having to travel long distances, so transport can be a significant cost. The Energy Saving Trust offer driver training which will cut your travel costs significantly. Training costs from £10 and can pay for itself in a few weeks because their fuel efficient driving tips could reduce fuel consumption by 15%. As well as saving money on fuel, eco-driving will improve road safely and reduce wear and tear. Zero-interest low carbon transport loans of £500 to £500,000 are available from Transport Scotland to support organisations that want to reduce the carbon impact and fuel costs of their transport. Eligible measures include low carbon vehicles, cycling facilities and even teleconferencing facilities. See the Energy Saving Trust website for the latest information on the scheme. Please contact us if you would like more details about our project or if you are interested in taking part in one of our campaign days. - Brae Ness Guest House, Inverness - Inverness YMCA "CYC"
Thank you to everyone who has taken part in our Keep The Heat In project!